We all know how bitter the British weather can get, but you can keep toasty by snuggling up with an electric blanket on a cold winter’s eve. The electric blanket might seem like an outdated concept that poses a number of health and safety risks, but with the improvement in technology, all the best electric blankets now come with overheat protection and features such as auto shut-off for complete peace of mind. If you’re someone who really feels the cold, then an electric blanket is a great way to warm up without switching the central heating on before summer’s even over. This will ultimately save you money and you’re likely to feel far cosier. There are also a few different styles around that all serve different purposes; from sleeping bag styles, to mattress covers and feet warmers to suit all tastes. You’ll want to think about where you plan to use it. Standard blanket styles are great for snuggling up on the sofa to watch TV, whereas some fasten to the mattress so it’s warm when you get ready for bed. You may want to look for smaller versions such as feet warmers or potable options that are good for travel, and also consider whether they are machine washable for hassle-free cleaning. Thickness, heat settings and hypoallergenic material are also important factors to consider; making sure you get the most out of your new snuggle buddy. If you are looking to create a cosy living area, you might want to check out our guide to the best bean bags. If you find yourself layering up before getting into bed, then why not consider the Dreamland Heated Fleece Fitted Electric Under Blanket. This is one of the best electric blankets for couples as it has a dual control which allows you to set the temperature from both sides of the bed. This blanket heats up in just 5 minutes so you can cosy up immediately. It is also super energy efficient and has a timer option which automatically switches the blanket off at your desired time so you don’t get too hot in the night. If it’s your first winter living by yourself or you only need to heat one room, then this is one of the best electric blankets for those on a budget. It is a single under blanket that heats up in just 15 minutes and is suitable for all night use. You can rest assured you won’t get too hot with its 3 different heat settings, and the overheat protection feature means you can sleep easy. This luxurious throw is far from the old electric blankets your grandma used to own. The Dreamland Faux Fur Heated Electric Blanket is stylish and super-soft; making it suitable for use in any room of the house. Curl up on the sofa with a movie or lay this throw on the bed to add style and comfort. Although pricey, this is a beautiful blanket that is designed with both aesthetics and function in mind. If you suffer with aches and pains during the cold winter months, then this heated foot warmer will make you feel all warm and fuzzy. A great alternative for those who don’t like to wrap themselves in a blanket, you can ensure you have toasty toes when sat reading your favourite book or watching the telly. It has an auto-shut off so that you don’t have to worry about remembering if you turned it off. The inner lining is removable making it easy to clean and keeps your feet fresh! 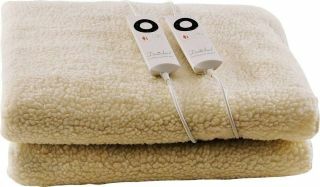 If you’re trying to cut down your heating costs then this is the best electric blanket for energy saving. Although a little pricey, this blanket runs at less than 1p for 7 hours of heat and will keep you warm all night long. Not only is it efficient, but it looks like a normal throw making it perfect for use in the bedroom and lounge. This blanket will stay looking plush as it is machine washable for easy cleaning. Do you hate sleeping with socks on, but then your feet get too cold? Then invest in the Cosy Toes under blanket by Dreamland. This blanket has extra foot warming technology so that you have a silent night’s sleep with no interruptions. This blanket does take a little longer to warm up, but once you’re in, we’re sure you won’t regret it. If you’re usually a restless sleeper, the ‘gentle heat’ setting will ensure your body is at the optimum temperature all night to discourage any disturbances. If you suffer from aching joints and muscles during the bitter cold months then this thermos therapy neck and back wrap is a fantastic way to target problem areas with the power of heat. This wrap fits your body shape making it perfect to wear any time of day or while you sleep. You can ensure you don’t get too hot with its built in safety system and auto shut off after 3 hours. This is a great alternative to painkillers and will also keep you warm on those extra chilly days. An alternative to an electric blanket is this rechargeable cordless heat pod which allows you to stay warm on the go. This is ideal for long car journeys, morning walks or at home on the sofa. Similar to a hot water bottle, the pod only takes 5 minutes to charge up and reaches a max temperature of 55 degrees. The pod stays warm for over 2 hours making it the perfect snuggle buddy when you’re feeling chilly. Liked this? Check out our guide to the best mattresses to really indulge in a cosier nights sleep.